Alumina/Titania is a ceramic composite material used as a wear resistant coating for machine components. Nanox S2613S feedstock powder is agglomerated nanoparticles with high flowability and an average diameter of 30 µm. 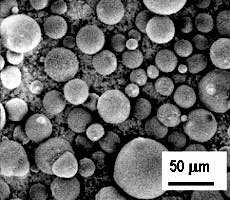 SEM micrograph typical of Nanox S2613S feedstock powder showing spherical geometry with high flowability. 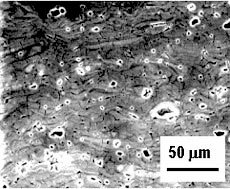 Cross sectional SEM view of a typical dense ceramic coating produced by a Metco plasma gun using Nanox S2613S feedstock powder. Pores (dark spots) occupy only 2 - 5 % volume. Inframat® Nanox S2613S is an excellent thermal spray feedstock for coating applications where resistance to wear, erosion, and corrosion at elevated temperatures is required. The Thermal Spray Grade material can be applied with DC Arc plasma guns. Full spray specifications are available through Technical Applications Bulletin No. S2613S.01.A. The information and recommendations contained in this publication are based upon data collected by Inframat® Corporation and believed to be correct. However, no guarantee or warranty of any kind, expressed or implied, is made with respect to the information contained herein, and Inframat® Corporation assumes no responsibility for the results of the use of these products and processes described herein. w or hereafter in existence.